1) The Alamosa Subdivision from milepost 180.0 near Walsenburg, CO, to milepost 299.30, the end of current UP ownership at Derrick, CO.
2) the Antonito Subdivision in its entirety from milepost 251.7 at Alamosa to milepost 281.78 at Antonito, CO. This is a total of 149.4 miles." He also added that the SLRG will hold trackage rights for the last five miles between MP 180 and Walsenburg to interchange exclusively with the UP. UP, in turn, will be running 5-day-per-week trains from Pueblo to Walsenburg. As I get more news (and as RA posts an official press release), I'll post it. Update(6/27-0725h): RailAmerica finally put out a press release confirming the sale. It's posted on the web here. DRGW 5377 is now showing as been leased back to UP as of today, 19-Jun-2003. Speculation is that it's a short term lease, and not a longer-term renewal of the original lease. It and its counterparts from that order seem to all be out working locals and short-haul manifests as of today, after sitting in North Little Rock for almost a month. UP 8620 is filling the fourth tunnel motor spot in Helper. While it's unfortunately a full-Armour Yellow SD40T-2, we can at least remember that underneath it's ex-DRGW 5363 doing the work. It will probably be around for a while, as none of the other three active DRGW tunnel motors show any signs of moving towards Helper to fill the vacancy. Yesterday, a Cimarron Valley train headed by four ex-DRGW GP30s (3020 and three others) was put off the rails at Montezuma, KS - just outside Dodge City. All four units wound up on their sides, and the engineer suffered a broken arm (as well as other abrasions, like the conductor). Last I heard, the FBI has been called in, as there is suspicion that tampering with a switch was the cause. The Dodge City Daily Globe has an article with photos. There's a lot of news from the past two weeks to catch up with, so here goes a very quick summary of what's happened in the Rio Grande universe since mid-May. There's a lot here to cover, so bear with me. The first thing is that the patching and painting has started up again - we've lost another GP40-2. DRGW 3094 was patched to UP 1353 at Roseville, CA, on 19-May-2003. 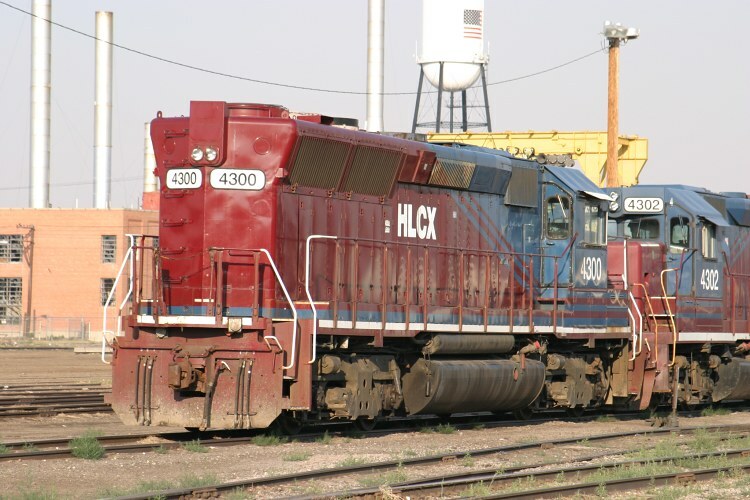 In related motive power news, the lease has apparently expired on the SD40T-2 batch from the January 1977 order (EMD 766050, DRGW 5374-5385). 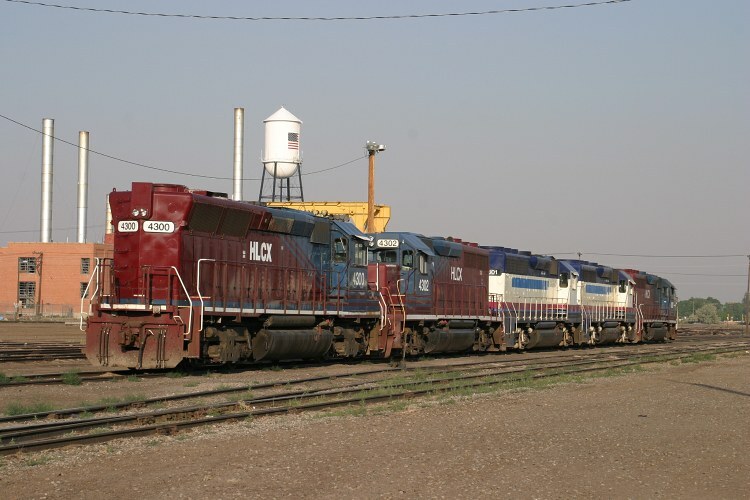 These units are congregating at North Little Rock, AR, for return to their lessor, GE Capital (GECX). The unfortunate part is that this group includes one of the six non-repainted units - DRGW 5377. 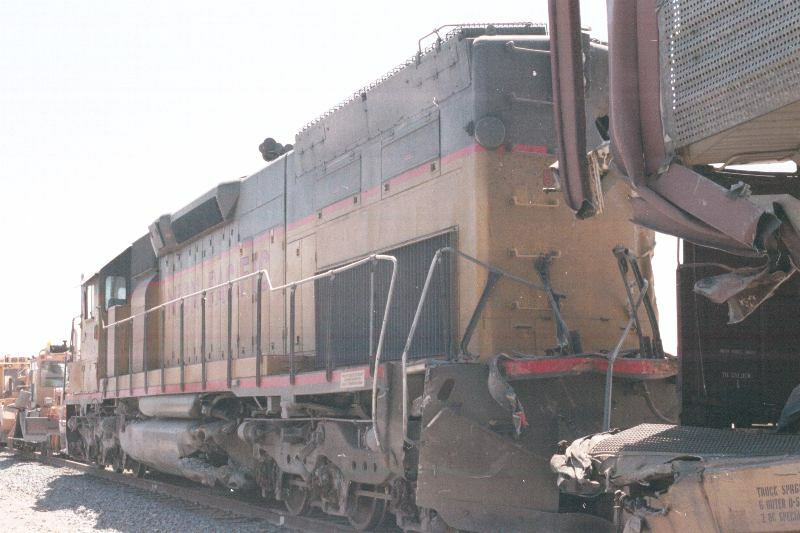 Also, I didn't catch this one initially, but on 21-May-2003, two UP freights collided near Gila Bend, AZ. The trains were on opposite tracks, going opposite directions - not a head-on as originally reported. Rather it was a derailment of one train into the other - not unlike the one at Plain several weeks back. Fortunately there were no serious injuries to the crews. Anyway, one of the units involved was UP 8602, an SD40T-2. I didn't catch this at first, but UP 8602 is former DRGW 5411. George Elwood's Fallen Flags site now has a few photos of 8602 in a post-wreck state: Photo #1 & Photo #2. Thanks to Ryan Martin for pointing that out on T/O this morning. Also, as if Amtrak's California Zephyr hadn't had a difficult enough time lately, the westbound Zephyr (#5) derailed at Dotsero on Wednesday, 28-May-2003. Apparently the first two express boxcars (cars 10 & 11 in the train) had a problem near the north switch of the wye and wound up derailed. For those who want the word from the original sources as well as a few photos from Lee Perkins, take a look at this Trainorders thread. Thanks to Paul Birkholz and Todd Busse for reporting this one.